Sarah Lucas (1962-), Artist. Sitter in 15 portraits, Artist of 12 portraits. 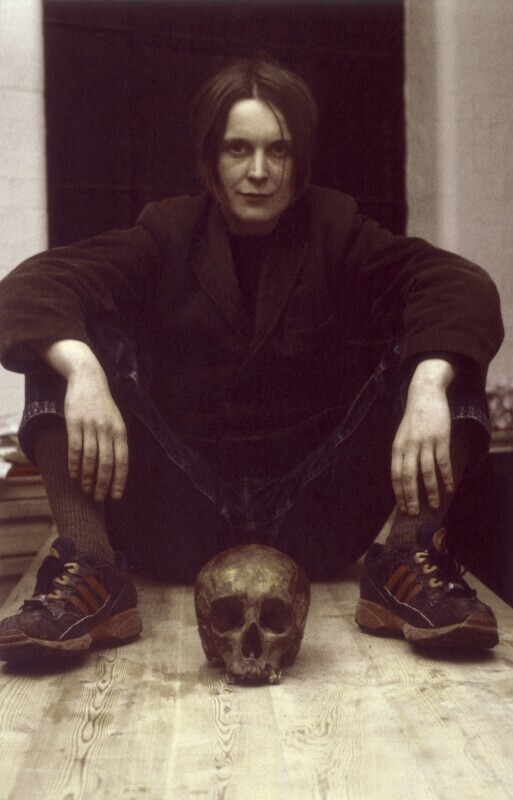 Sarah Lucas (1962-), Artist. Artist of 12 portraits, Sitter in 15 portraits. In this vanitas image, the inclusion of the skull is a metaphor for death. This is one of twelve prints; in each Lucas appears in a different guise. The Labour party - re-branded as New Labour - win a spectacular landslide election and Tony Blair becomes Prime Minister. Their electoral campaign promised that 'things can only get better' and that their priorities would be 'education, education, education.' While New Labour's 'third way' centralist approach put off some party traditionalists, it secured the popular vote. Princess Diana and her lover Dodi Fayed die in a car crash in Paris. J.K. Rowling publishes Harry Potter and the Philosopher's Stone, the first of seven fantasy books chronicling the life of Harry and his friends at Hogwarts School of Witchcraft and Wizardry: learning magic, breaking school rules, romantic entanglements and their struggles against the evil Lord Voldemort. Scientists at the Roslin Institute in Scotland announce that they have cloned the first mammal from an adult cell: '6LL3', or Dolly the Sheep. Governor of Hong Kong Chris Patten hands the island back to China after one hundred and fifty years as a British Colony. Although sovereignty was restored to China, it was agreed that the Island would become a 'Special Administrative Region' under the 'One Country, Two Systems' principle, effectively keeping its capitalist economy and way of life for a period of 50 years.